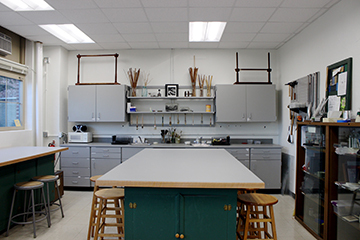 The Kolarik Book Studio is located in North Hall, along with our papermaking and print studios. Kolarik is a fully equipped bindery with open workspace in which binding and artist book classes are held. Equipment includes two board shears, several kutrimmers, guillotine, standing press, nipping presses, job backer, sewing frames, plough, foil stamper and drill press. The studio also includes a variety of hand tools and equipment such as Japanese screw punches, leather working tools, and cold metal working tools. In addition to Kolarik Book Studio, Center students also have access to Rooms 22 and 25, which serves as graduate student storage and work space and contain additional binding equipment. Center students also have access to the Historical Book Model collection at the UI Libraries Conservation Lab. UI Libraries Special Collections is another resource for both historical and artist's book structures. The Center offers a variety of courses in bookbinding: for complete course descriptions, see the Center for the Book listing in the UI Catalog. For Center course availabilities, check listings at MYUI; enter "UICB" in the "Course Subject" field then click on "Search." Hands-on introduction to materials and techniques commonly used in bookbinding. Build on skills acquired in Bookbinding I; projects to complete six bindings based on historical and contemporary models; sewing styles, board attachments, endband types; nonadhesive and case-bound structures, varied materials and binding styles, their effects on structure, aesthetic considerations, further development of solid binding skills; historical development of particular binding practices. Advanced studies in bookbinding; fine binding styles, leather paring and tooling, advanced finishing techniques, refining skills; continued look at differences in regional binding practices, how these differences affect function, and why particular styles developed. Topics related to hand bookbinding. Exploration of the book as a form for artistic expression; emphasis on conceptual development; relationship between content, form, and structure; how a book's structure and design can enhance and integrate part of the work's meaning. Hands-on techniques for a variety of book enclosures; appropriateness, aesthetic issues concerning box design; Japanese wraparound case, drop-spine box, hinged and lidded boxes, slipcase; technical skill development. Practical methods, materials assessment, conservation history and evolution.